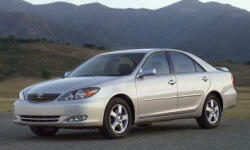 Toyota Camry Driving Position & Visibility Pros and Cons | Page 1 of 1 | Why Not This Car? Though the new Sonata's instrument panel is a little tall for my taste, good visibility in all directions boosts driver confidence. Instrument panel ergonomics are good by current standards, with controls that are easy to understand, reach, and operate. All seating positions are very comfortable. Drivers visibility is hampered by the width of the A and B pillars. The A pillars are rather large and can restrict visibility when driving curvy roads. Everything! Poor visibility to the rear. B pillars block view of oncoming traffic. Windshield rake is too steep for this driver. Plenty of zip for merging, passing, and even a little fun. Cannot see the corners of the car or anything to the rear of the car. Accord is much more comfortable. Can clearly see vehicles/objects all around. Mirrors cover the corners of the car. Easy to park.